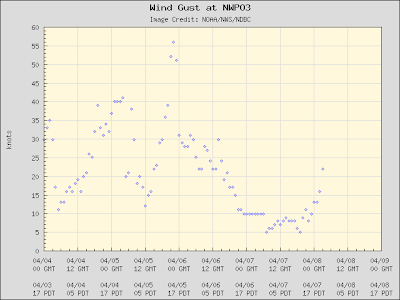 Weather prediction has come a long way, but sometimes forecasters miss a significant event and Monday's windstorm over the Oregon coast and the Willamette Valley was a good example. The satellite picture above shows a tight low center making landfall near the Oregon/Washington border. 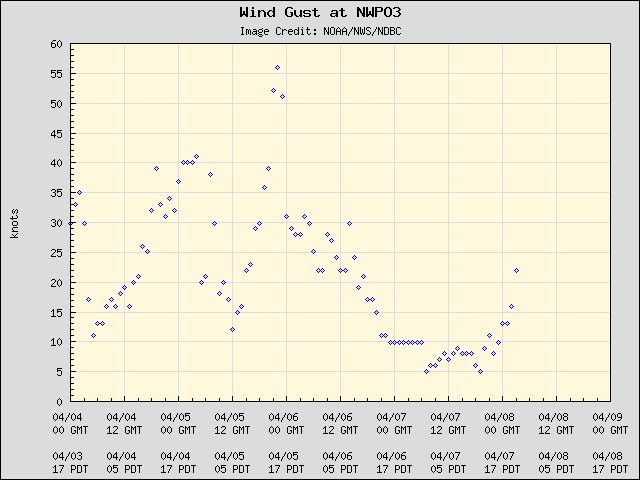 As shown in the list below, winds of 50-70 mph were observed at a number of locations along the Oregon coast (click on the graphic to get an enlarged clear image) And here is a plot at Newport, Oregon, where there was a peak gust of roughly 55 knots on Monday, April 5th. .TONIGHT...SHOWERS LIKELY. A SLIGHT CHANCE OF THUNDERSTORMS AFTER MIDNIGHT. LOWS 35 TO 40. SOUTHEAST WIND 10 TO 20 MPH. .MONDAY...SHOWERS LIKELY. A SLIGHT CHANCE OF THUNDERSTORMS IN THE MORNING. HIGHS AROUND 50. SOUTH WIND 10 TO 15 MPH. .TUESDAY...MOSTLY CLOUDY WITH A CHANCE OF SHOWERS. HIGHS 50 TO 55. .TONIGHT...SHOWERS. A SLIGHT CHANCE OF THUNDERSTORMS OVERNIGHT. LOWS 35 TO 40. SOUTH WIND 15 TO 20 MPH. MORNING. HIGHS NEAR 50. SOUTHWEST WIND 15 TO 20 MPH. .MONDAY NIGHT...SHOWERS LIKELY. LOWS AROUND 40. SOUTHWEST WIND 15 TO 20 MPH. The NWS was only going for 15-20 mph! Clearly, the forecast models had some problems the day before--which is not surprising for a small scale low coming off the Pacific. Below is the wind and sea-level forecast valid 2 PM on Monday for a simulation started at 5 AM on Sunday. A weak 1003 mb low was evident as we brisk, but modest winds. Contrast that with the second graphic for a forecast started 24-h later--a 998 mb low and much stronger coastal winds. This is not the first surprise storm associated with a small, intense low center to hit Oregon...another occurred during Feb 7, 2002---the South Valley Surprise Storm (check out: http://www.climate.washington.edu/stormking/ to find a description of that event).